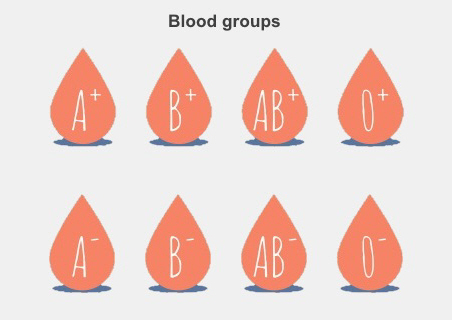 Everyone belongs to one of four blood groups: A, B, AB, or O. These groups are defined by the types of protein on your red blood cells. However, your blood type is also classified by another protein, called rhesus. Most people have this protein on their red blood cells and are called rhesus positive. If you don't have this protein you are rhesus negative. Being rhesus negative isn't a bad thing – it doesn't usually cause any health problems. However, if you're pregnant, there are some things you need to know about. Can being rhesus negative harm a baby during pregnancy? A woman and her baby have separate blood supplies. Usually, only nutrients and waste products move across the placenta between the mother and the baby, while blood doesn't. However, problems can occasionally happen if the woman has rhesus negative blood and the baby has rhesus positive blood, and some of the baby's red blood cells cross the placenta to come into contact with the mother's blood. If this happens, the mother's immune system can make antibodies, which attack and destroy the baby's red blood cells because they're different. As a result, the baby gets anaemia (meaning they have low numbers of red blood cells). They then release a substance called bilirubin, which causes jaundice. This doesn't happen if a woman is rhesus positive and her baby is rhesus negative. We can stop this happening by giving the mother a medication called anti-D within 72 hours (three days) of the baby's blood crossing the placenta. But if the woman starts making antibodies, nothing can stop it and it will continue happening in the future. This may affect future pregnancies. Jaundice is the yellowing of the skin. Usually this is mild, but in severe cases it can lead to brain damage in a baby. You can read more about it in Jaundice in babies. if you have an injury to your tummy during pregnancy (for example a car accident or a fall). These are called sensitising events, because there's a risk your baby's blood has crossed the placenta and your body may start making antibodies. If any of these things happen, contact your midwife. You need to have anti-D within 72 hours to stop it from happening. If you have a sensitising event, your midwife or doctor will offer you an injection of anti-D. Anti-D is a blood product, made from donated blood. It helps to remove your baby's red blood cells from your circulation so you stop you making antibodies against them. This prevents harm to your baby and any babies you have in the future, and has a 90% chance of working. After your baby is born, blood from the umbilical cord or placenta will be tested to check your baby's blood group. If your baby has rhesus positive blood, your midwife will offer to give you an injection of anti-D. If your baby has rhesus negative blood you will not need to have anti-D because there is no risk of making antibodies. In very rare cases, anti-D may cause a severe allergic reaction. For this reason, it's best to have it at a hospital or GP surgery. Beyond that, anti-D is very safe. You may get soreness at the injection site, while there is a small chance you may also get a fever, headache, or rash after the injection. As with any blood product in New Zealand, anti-D is checked for infections before you receive it, to keep you as safe as possible. Information from the New Zealand Blood Service about Anti-D Immunoglobulin. Patient Info – Blood grouping (typing), retrieved August 2016. Patient Info – Haemolytic disease of the fetus and newborn, retrieved August 2016. NZ Blood – Anti-D Immunoglobulin, retrieved August 2016. NZ Blood – A spotlight on plasma: anti-D Immunoglobulin, retrieved August 2016.